Domino Data Lab is an enterprise data science platform focused on helping data scientists build and run a wide range of data models, including those focused on AI and Machine Learning (ML). The main emphasis of the company’s solution is on providing a collaborative environment for data scientists to build reusable, reproducible models to assist with data analysis tasks. The solution provides aspects of infrastructure automation, collaboration in a managed identity context, and automated reproducibility of data science models, combined with a cloud-based Compute Grid or on-premise solution to reduce software configuration time by running code in Docker containers. 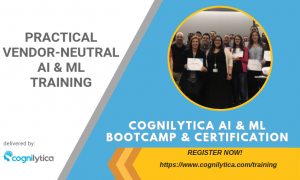 Cognilytica Access Subscribers get free access to this report!